Woods Foundation School has remained on Lingwood Lane (formerly known as School Lane as well as Lambley Lane at various times) throughout its three major stages of development, albeit at different sites. These sites are clearly identifiable from the plan on the left. The first school was a two story building which was later increased by the addition of a third storey as can be seen in the 1922 photograph on the left. The change in brickwork to heighten the building is also visible. Elsewhere on this website there is an article about this building entitled The Old Vicarage, first as a school then as a Vicarage. The building has been subject to a great deal of phased extensions and alterations over these 142 years. 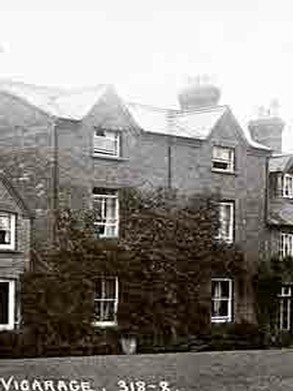 It eventually became a vicarage in 1878 when a new purpose built school was opened further along Lingwood Lane on the opposite side of the road. To read more about the building use this link: Woodborough was endowed with a school 134 years before the first Education Act. In 1736 the Rev’d Montague Wood, Rector of St Michael Royal, London founded the first school in Woodborough and endowed it with 60 acres of land at Blidworth, Stapleford and Woodborough. The rents and profits from this land were administered through Trustees and used to provide a salary for the schoolmaster and for repairs to the school building. Montague Wood was a descendent of John Wood who gave the altar table and who owned Hertford Manor (known locally as ‘Middle Manor’ but known today as the Manor House). This was sited on the west side of Governors’ Field with the church on the east side. His sisters were buried in Woodborough in 1722 and 1738 and memorials to several of the Wood family are to be found on the north side of the chancel. He helped to increase the endowment of the vicar of Woodborough and finally left his local property to William Edge, the churchwarden who was so concerned about non-resident vicars. Woods School was thus funded by a trust to advance the education of the youth in accordance with the doctrines of the Church of England. There were always three Trustees who would include the ministers of Lambley, Woodborough, and Epperstone. The original school, which was part of the Old Vicarage, had a schoolroom 18ft long by 14ft 6in. wide and 8ft 6in. high. Alongside was a cottage not much bigger; Richard later enlarged the building to 23ft by 19ft 8in. with an adjoining study and two storeys of bedrooms above. It also had two cellars with kitchen and pantry above and a bedroom, so he could take boarders. Mr Oldacres died in 1785 after being master for 22 years and was succeeded as Curate and Master by his son, the Rev’d Samuel Oldacres who rebuilt the school and further enlarged the house at a cost of £300, adding conveniences for £100 and a stable and coach-house, since demolished, for £60. His salary was £95. When Samuel became Rector of Gonalston in 1812, the Rev’d James Hewes, who had married Richard's sister, succeeded him. James died in 1837 and was succeeded by Richard's grandson, the Rev’d Samuel Lealand Oldacres with a salary on £109 per annum. In 1840 he was responsible for rebuilding the whole of the original school except the outer walls, and enlarging the house. He also built “garden walls and conveniences” and a stable and coach-house. Following the Education Act of 1870, a Government Inspector reported that the school was unsuitable because the rooms were less than 10ft in height and it was proposed that the school should become a Church School under Government Inspection. The Rev’d Oldacres was not happy with this, saying, “I challenge the kingdom to find a parish where scholastic and clerical duties have been performed by one family for such a small remuneration for 112 years”. He then put forward a case to keep the school under his control. Public meetings were held, and though not everyone in the village agreed with his view, a scheme was finally approved that secured the intention of the founder to, “provide for and advance the education of youth in accordance with the doctrines of the Church of England”. At the same time it was ordered that a new school be built within one year. It was planned that the Rev’d. S L Oldacres would then retire but could retain the use of the schoolhouse for life with a pension of £50. However, he died on 29th May 1876 and was succeeded as vicar by Rev’d F G Slight who was able to arrange for the purchase of the old school and its house to be used as the St Swithun’s vicarage. The Oldacres family gave tremendous support to the church and school in Woodborough and their three graves are in the Churchyard just inside the gateway off Lingwood Lane. Under the new arrangements, the school had six Governors (instead of three Trustees) who raised money to build the new school by selling buildings and land, and Mr Bliss Sanders was appointed architect. Although the building contractors were declared bankrupt during the building period, the new school was opened as a Public Elementary School on 29th July 1878. In celebration, Canon Hole, Dean of Rochester, preached a sermon in the church and there was a procession of children and a public tea. This historical account of the school has been drawn from the following:- 'The History of Woodborough’ by Rev’d W E Buckland, first published in 1897 (printed in full elsewhere on this website). The booklet ‘Wood’s Foundation School Woodborough 1736-1986’ published by the School Governors to commemorate in 1986 the 250th Anniversary of the founding of the school. We bring the history completely up-to-date with additional material, a former Headmaster, Mr Geoff Ellis, writes about the period from 1986 to 2002. The Trust funds provided for a house in Woodborough, which had a schoolroom and garden that eventually became the vicarage for St Swithun’s. The Rev’d Montague Wood retained the power for life to appoint the master, but at his death this role was performed by a majority of Trustees. The headmaster was Mr John Thorpe, and after his death in 1763, the Trustees advertised for a master “of sober life and conversation, capable of teaching to read and write in English and to cast accounts….. The salary about £20 a year with a convenient new house etc”. Mr Wildbore was selected but as he died almost immediately, Mr Richard Oldacres, who had himself started a private school earlier at South Wingfield in Derbyshire, was appointed on August 8th 1763. This began 112 years of teaching in Woodborough by the Oldacres family. The letters of Richard Oldacres show him to be an enthusiast for education both for himself and others. He taught day and evening schools and at the same time prepared himself for ordination becoming Stipendiary Curate as well as schoolmaster. Records show that he also took in a number of boarders. Charges varied according to age. For children under nine years of age the cost was £2. 5s.0d. per quarter rising to £3.10s.0d. for those aged over fifteen years. The subjects taught were, English, French, Latin and Greek languages, writing, arithmetic, merchants’ accounts, geometry, algebra, surveying, navigation, astronomy, or any particular branch of mathematical or philosophical learning, music and dancing when required.